We are the manufacturer, supplier and exporter of Decorative Silk Paintings such as Silk Paintings. Our paintings are fabricated from pure silk, which is procured from the quality and durability. To meet the requirements of our esteemed clients we have designed the painting in different patterns and colors. Our range is widely famous for the smoothness of Chinese silk paintings, Japanese silk paintings, pure silk and Khadi silk painting. 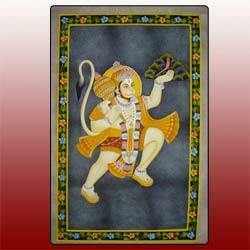 We are a reputed name in this domain, engaged in offering a premium quality range of Hanuman Silk Paintings. 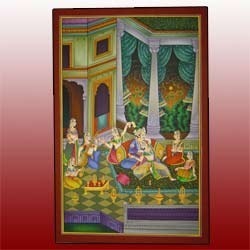 Our offered silk paintings are precisely crafted on silk canvas using best painting colors & tools. We provide these silk paintings in different customized form in terms of patterns, sizes and colors. 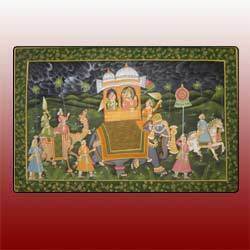 Offered silk paintings are provided in best packing & checked before the final dispatch. We are a prominent manufacturer, exporter and supplier, engaged in offering an exclusive range of Decorative Silk Paintings. 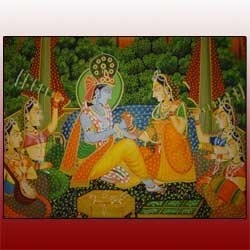 Offered silk paintings are designed on silk canvas by our skilled painters. Our silk paintings are highly praised by the clients for its artistic look that can enhance the appeal of the interior. Moreover, our valuable customers can avail these silk paintings from us at reasonable prices. With huge industry experience and knowledge, we are passionately engaged in offering an extensive array of Decorative Silk Paintings. Our provided silk painting is crafted from the quality assured silk canvas & best painting colors. Also, our provided silk painting will surely enhance the look of interior of various places like hotels, home & offices. Our silk painting is checked by skilled workforce so as to deliver a defect free range. We are getting huge appreciation from our clients for offering a comprehensive range of premium quality Decorative Silk Paintings. 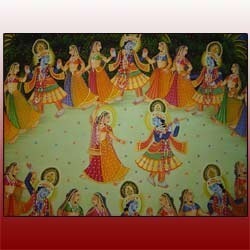 The offered silk paintings are designed with precision by our creative painters. These silk paintings are available in various colors and designs to cater diverse requirements of our customers. Our prestigious clients can avail these silk paintings from us at affordable price in quality packing. We are engaged in manufacturing and exporting Decorative Silk Paintings that are in high demand in the market. We offer Silk Paintings, customization in our paintings and design and develop these items as per the color schemes and picture themes specified by our esteemed clients. Looking for Silk Painting ?